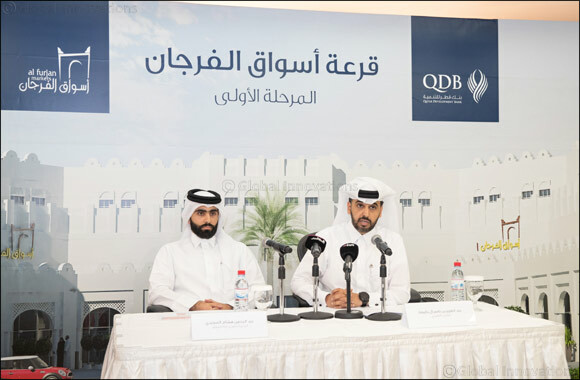 Doha- 10 October, 2018 – Qatar Development Bank (QDB), in its continued quest to support the growth and competitiveness of the business sector in the state, announced the registration for Al Furjan markets phase I raffle draw to award retail space, starting October 21, 2018. The registration process will last for 30 days, and the bank is inviting all Qatari citizens to apply through Al Furjan mobile application to supervise the governance of the raffle process and to ensure total compliance and transparency. The path breaking plan was announced yesterday, on Tuesday October 9, during a press conference, held at QDB main building. A detailed explanation of the application process and selection of candidates was provided. This is the first raffle draw to be held by QDB while the previous one was conducted by the Ministry of Economy and Commerce (MEC). An integrated electronic system has been developed to allow applicants to apply for the Al Furjan markets Project through Al Furjan mobile application, which can be downloaded from Apple Store or Google Play to compete for over 45 retail stores during the first stage. Qatar development bank has taken all the required measures to overcome and control any obstacles or difficulties that might complicate any procedure associated with the raffle draw and applicants are required to deposit some funds or relevant licenses as a form of guarantee. Al-Furjan mobile application does not require any administrative or financial requirement, as it aims to facilitate the application process for citizens and encourage them to apply for Al Furjan markets project. Moreover, this mobile application version provides applicants the opportunity to clearly browse and select among a list of many vacant shops according to the required commercial activities, and identify their locations through a map link in the application as well as apply to those vacant shops as per area and activity criteria. The verification process will be done using the QID and date of birth to verify the identity of the applicant. The applicant is only required to insert the identity card number, and the date of birth. In case the applicant has any valid Company Registration (CR) he wishes to use within the Al Furjan market, then he must uploaded a soft copy of the CR through Al Furjan mobile application, otherwise the applicant can just tick the ‘No Company available’ box and no documents will be required. After selecting the winner, the applicant must issue a commercial record consistent with the assigned activity within a maximum of 10 working days. The Al Furjan Markets project is a unique initiative launched in collaboration with a number of the government sectors, in cooperation with QDB, which is handling all construction and administrate work for the project. The initiative is considered one of Qatar’s strategic projects and is intended to support the commercial sector in the country, as part of the development of a sustainable economy in line with the Qatar National Vision 2030 to create a diverse permanent economic environment. The motivation behind this project is the forecasted increase in population within the city of Doha and its surroundings. The retail mix has been devised to cater to the most important needs.